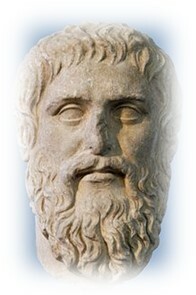 Plato was perhaps the most significant of the ancient Greek philosophers. In The Republic (part seven, book seven) he offers us possibly the most enduring piece of philosophy ever written, his allegory of the cave. It’s worth checking out the original, but here is a brief summary of the essential idea. Plato compares the human condition to prisoners in a cave, chained so that they can only look straight ahead of them and cannot turn their heads. All they can see is a wall onto which are projected shadows of figures who are in reality standing behind them. Since that is all they have known, they take these shadows to be reality, and do not understand that what they are seeing is something emanating from elsewhere, a by-product of a different level of reality. Two obvious points can be made about this. Since shadows are non-material, this is a decisive statement in favour of the philosophy of Idealism – what appears to be matter is an illusion; there is nothing but consciousness. Secondly, this is exactly what Eastern religions have been saying for thousands of years; the word they use is maya (1). Helena Blavatsky, the co-founder of the Theosophical Society, who said: “Although twenty-two and a quarter centuries have elapsed since the death of Plato, the great minds of the world are still occupied with his writings. He was, in the fullest sense of the word, the world’s interpreter” (3). Ralph Waldo Emerson, a giant from the world of American spirituality, who said: “Out of Plato come all things that are still written and debated among men of thought. … Plato is philosophy, and philosophy, Plato… …and the thinkers of all civilized nations are his posterity, and are tinged with his mind” (4). Equally significant are the thoughts of Sir Arthur Eddington who, clearly thinking of Plato, said: “Matter and all else that is in the physical world have been reduced to a shadowy symbolism”. The material world “which seems so vividly real to us is probed deeply by every device of physical science and at bottom we reach symbols. Its substance has melted into shadow” (both my italics) (6). Werner Heisenberg also made the same point: “Modern physics has definitely decided for Plato. For the smallest units of matter are not physical objects in the ordinary sense of the word: they are forms, structures, or – in Plato’s sense – ideas” (7). So an interesting question for modern scientists is, how did Plato manage to be over two thousand years ahead of his time? He understood something essential about the nature of reality, presumably without the technology available to twentieth century scientists. “A history only gives a story of the shadows, whereas a myth gives a story of the substances that cast the shadows”. “These multifarious workers in the invisible worlds cast their shadows on physical matter, and these shadows are “things” – the bodies, the objects, that make up the physical universe. These shadows give but a poor idea of the object that casts them”. “History is an account, very imperfect and often distorted, of the dance of these shadows in the shadow-world of physical matter” (8). St. Paul, while using a different image, here seems to be alluding to the same idea: “For now we see in a mirror, dimly, but then (i.e. when the illusion is removed) we will see face to face. Now I know only in part; then I will know fully” (p9). This passage has also been translated: “At present all we see is the baffling reflection of reality; we are like men looking at a landscape in a small mirror. The time will come when we will see reality whole and face to face” (10). This makes the connection with the cave allegory more clearly. Islam is also comfortable with the idea. The Sufi writer Abu Bakr Siraj ad-Din (Martin Lings) said: “…if a world did not cast down shadows from above, the worlds below it would vanish altogether, since each world in creation is no more than a tissue of shadow entirely dependent on the archetypes in the world above” (11)..
Philo Judaeus. We know that the Jewish religion can be very isolationist at times. This highly significant Jewish philosopher nevertheless felt the need to accommodate Jewish thinking with Plato. In the words of David T. Runia: “Philo tried to show that Jews need not be ashamed of their heritage, that loyalty to the Law did nod entail a rejection, but precisely a deepening of the ideas of Hellenism” (12). The continuation of Plato’s ideas by Plotinus, Proclus, Porphyry and others from the third century onwards, which we now call Neo-Platonism, although these figures would have called themselves merely Platonists. The spectacular Italian Renaissance was a rebirth of ancient traditions, especially Greek ones including Plato. One of England’s greatest poets William Blake seemed to live in touch with higher levels. The Blake expert Kathleen Raine describes him as a Platonist (13). In these lines from The Marriage of Heaven and Hell Blake seems to be referring directly to Plato’s allegory: “If the doors of perception were cleansed every thing would appear to man as it is, infinite. For man has closed himself up, till he sees all thing thro’ narrow chinks of his cavern”. “(Some philosophers regard visual representations) as products of perceptions that are removed from reality and ultimately amount to nothing more than the play of shadows. We have learned to accept them as real through conventions and customs that hold us captive. Magritte depicted Plato’s allegory expressly in many works by isolating and reassembling its essential elements – the fire and the view from an enclosed space such as a cave, a room, or a house”. The psychologist and neurologist John R. Smythies called his book on the nature of consciousness The Walls of Plato’s Cave (15). The novelist and writer Graham Dunstan Martin calls his very interesting book on the nature of consciousness Shadows in the Cave, and unsurprisingly begins with an account of Plato’s allegory (16). So Plato’s allegory has been an inspiration for spiritual seekers, scientists, poets, artists, and film-makers. Does this have any relevance for modern times? I believe that it does, especially for science and politics. I’ll return to that topic in a later post. 4. Complete Prose Works, Ward, Lock & Co, 1900, p169. Emerson’s essay on Plato gives some insight as to why he is held in such high regard. 14. David Lynch is known to be a long-term Transcendental Meditation practitioner. He talks in terms one would expect of stilling the mind and discovering bliss. His inner journey, however, seems to have given him extraordinary insight into the nature of the psyche, as Mulholland Drive demonstrates. Though the film is deemed cryptic and hard to understand, it was nevertheless voted best film of the millennium in a poll of 177 film critics in 2016.